Organisers of the months-long demonstrations that triggered the overthrow of Sudan’s President Omar al-Bashir have urged pro-democracy supporters to protest against a military takeover, renewing their demands for a civilian-led government. 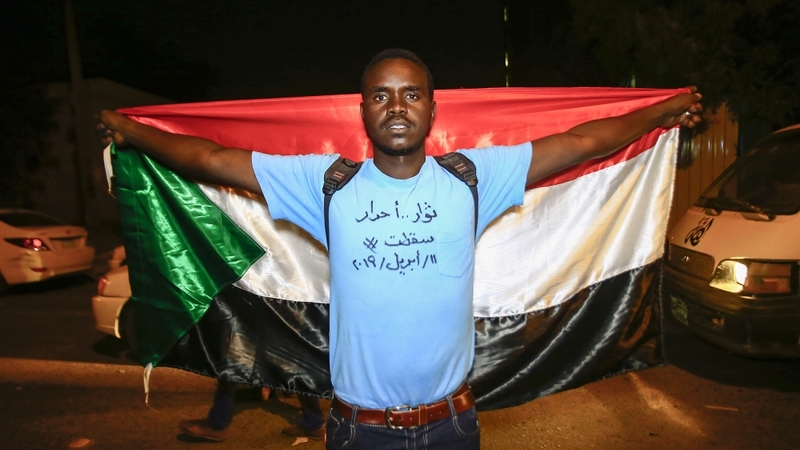 The appeal by the Sudanese Professionals Association (SPA) came late on Thursday as tens of thousands of protesters defied a nighttime curfew announced earlier in the day by General Awad Ibn Auf, who was sworn in as the head of a military council that replaced al-Bashir. In a Twitter post, the SPA called on protesters to “gather now” and continue a days-long sit-in outside the army headquarters in the capital, Khartoum. The Central Committee of Sudanese Doctors said that at least 13 people were killed when security forces intervened in Thursday’s protests. They included two demonstrators in the capital Khartoum, the committee said in a statement on Friday. Since Saturday, at least 35 people have been killed in clashes with security forces, which have repeatedly tried to disperse the sit-in by force, it added. Outside the sprawling complex, protesters beat drums, sang and chanted slogans such “Peace! Justice! Freedom!” and “The first one fell, the second will, too!” as they thronged the area overnight. Since December, Sudan has witnessed persistent demonstrations sparked by rising food prices that quickly escalated into wider calls for the departure of al-Bashir, who came to power in a 1989 coup. Dozens of people have been killed in protest-related violence since the demonstrations began. The crisis intensified on April 6 – the 34th anniversary of a non-violent uprising that removed ruler Jaafar Nimeiri – when thousands began amassing in front of the army headquarters. As the protesters refused to leave, while braving live ammunition, rubber bullets and tear gas, state media said on Thursday morning that the army would make an “important announcement”. This raised expectation of al-Bashir’s removal and prompted celebrations in the streets of Khartoum. Later on in the day, in a televised address to the nation, Ibn Auf announced that 75-year-old al-Bashir had been overthrown and taken to a “safe place” after being arrested. But the protesters’ jubilation quickly turnedto anger when Ibn Auf, who Bashir appointed first vice president in February, also said that the military council would run the country for a two-year transitional period. He also declared a three-month state of emergency and suspended Sudan’s constitution and imposed the month-long curfew, from 10pm to 4am. Later on Thursday, Ibn Auf was sworn in as chief of Sudan’s new ruling council. Protesters denounced the military’s moves, with the SPA demanding the “handover of power to a civilian transitional government that reflects the forces of the revolution”. Amid the uncertainty in Sudan, politicians around the world appealled for calm and restraint. Antonio Guterres, the United Nations secretary-general, called for an “inclusive transition” that will meet the “democratic aspirations” of the Sudanese people, while the African Union said a “military takeover was not the “appropriate response” to the country’s challenges. The United States, Britain and the European Union called for a civilian-led transition, but Egypt, Sudan’s neighbour, said it had “complete trust” in the country’s military to “overcome this defining phase and its challenges”. Payton Knopf, an analyst at the United States Institute for Peace, called for an international consensus on a civilian-led transition in Sudan, warning that failure to do so could lead to “chaos” in the country. “It’s increasingly clear that a military government with or without Bashir will neither have the political or economic resources necessary to address the crisis of legitimacy in the country, and the crisis facing the economy,” he told Al Jazeera from Washington, DC. Jean-Baptiste Gallopin, researcher at Yale University, said any solution to Sudan’s crisis “will require the regime to make an earnest effort to open this transition to civilian figures and to really put this process in their hands”.